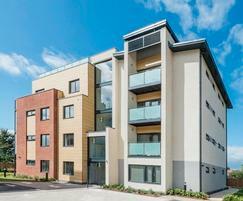 Kingswood Place is a new-build housing development comprising 43 residential homes and three commercial units. It was built to comply with Level 4 of the Code for Sustainable Homes. 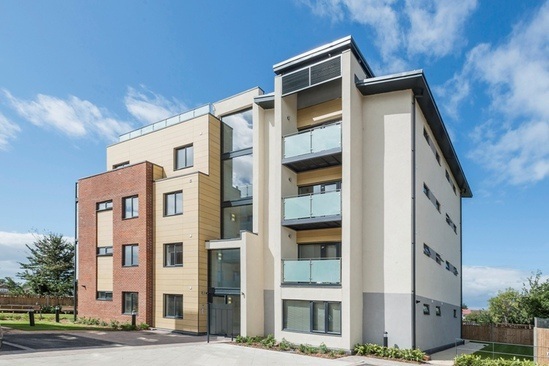 The development features attractive landscaped grounds, with each apartment including an allocated parking space and private residents' access to Rosedale Park. Building materials used for the external envelope included cladding, bricks, render and glass, so it was important that the materials worked well together to fulfill the brief. Surrey-based property developer, Vantage Homes was responsible for this project, and specified Cembrit Cembonit cladding, which was supplied via leading distributor of high performance cladding, PCP Cladding Ltd & Premier Building Products Ltd.
Cembonit fibre cement cladding was successfully used to create an attractive finish for the six new multi-use units. The through-coloured sand cladding complements the other materials used for the external envelope, providing a subtle, neutral contrast. Installed in a traditional manner, the contractor opted to use wooden frames instead of the more common method of aluminium brackets and rails. The cladding was bonded to the frame, using a primer and activator. This method means that no fixings are on show, providing a smooth finish to the building. The residential side of the scheme achieved Code for Sustainable Homes Level 4. While this standard is no longer a Government initiative, the buildings are designed and constructed sustainably, which is welcomed by the industry and run energy efficiently for the residents.